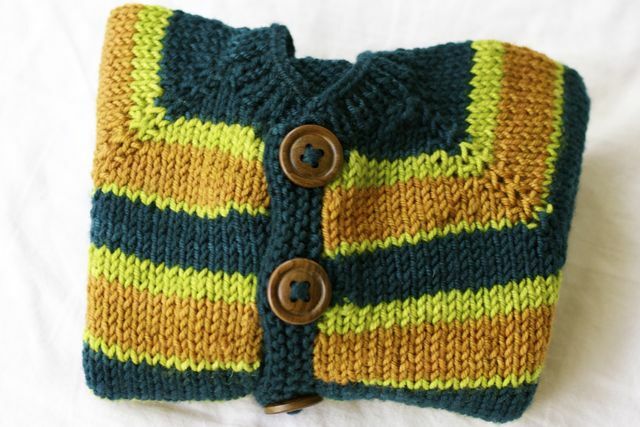 It’s not that I don’t love knitting baby items. I actually love knitting them even more now than when I was preggers. It’s that there is no real way to size a baby. They are all just too darn different. 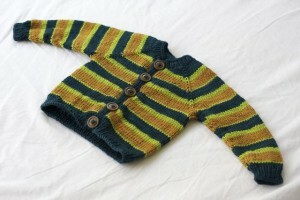 Above is a photo of 2 baby sweaters that are apparently the same size – 9-12 months. They are only a little bit big on miss Hunter (who is 12 weeks old) right now. Does this mean that the patterns are flawed? Nope. 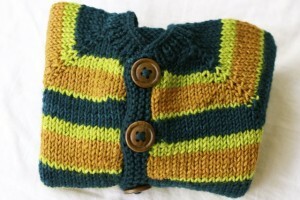 I really enjoyed the Owlet pattern, it knit up so quick and it looks so cute! It just means that babies are very different sizes and it’s nearly impossible to knit for a particular age for the first year or two. I originally knit the Owlet so it would fit her at 9 months, in September/October when the weather is turning cold again. Not gonna happen. She will be wearing it on some cooler summer nights instead. 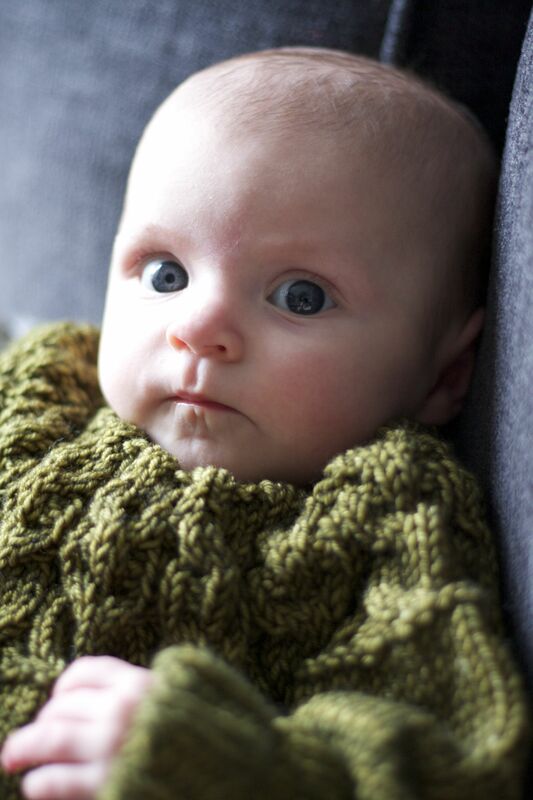 Once I accepted that I cannot size a baby to a specific month, or even a small range of months, life as a knitter became easier. I could freely knit some larger sweaters and not concern myself with the exact date she would be able to wear the garment. I remember when she was first born and I was disappointed nothing I knit would fit her. Now I have a slightly different spin on the subject: who could know? My mum is tells me about how she didn’t have a sleeper big enough to take my youngest brother home from the hospital because he was so big when he was born. There is just no telling! 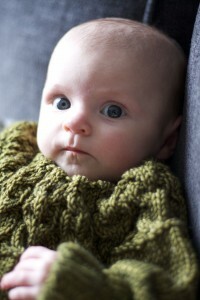 So if you’re knitting for a babe, just knit a bigger size and go with the flow. 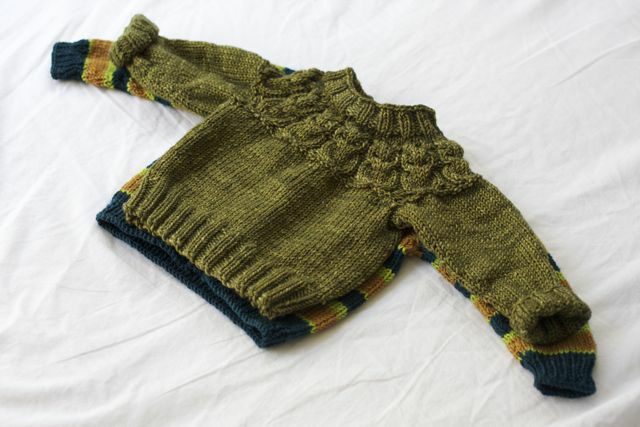 The sweaters above are the Owlet and the Simple Raglan Top Down Baby Cardigan (knit for Hunter by the lovely Kynna). They are both aran weight sweaters (18 stitches per 4 inches) so they knit up in no time! Pick up a couple of SweetGeorgia skeins and knit something sweet for a babe today! This entry was posted on Friday, April 15th, 2011 at 10:22 am	and is filed under Uncategorized. You can follow any responses to this entry through the RSS 2.0 feed. Both comments and pings are currently closed. Having knit many baby sweaters over the years and having two very different sized babies,I could not agree more Alexa. Better to knit a little bigger! Nothing more sad than having done all the work and have it be too small.